If you are in search of lake homes for sale in Texas, look to Lake Buchanan. The great Colorado River feeds Lake Buchanan, the oldest and second-largest of the region’s Highland Lakes. Lake Buchanan is a scenic wonderland, where you’ll indulge in stunning landscapes, sprawling beaches, adrenaline-pumping recreation, cool waters, and so much more! Spanning into Burnet and Llano counties, Lake Buchanan’s waters spread across 22,333 acres. This impressive amount of space means that ...Learn more here! 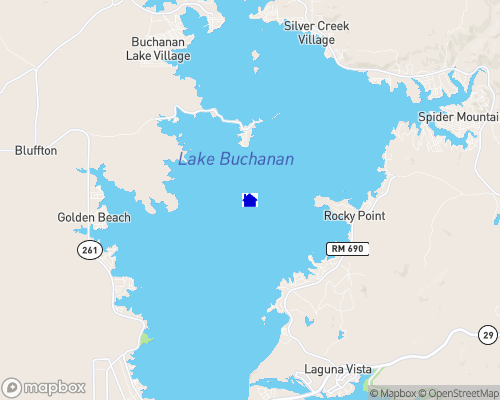 If you’re in search of lake homes for sale in Texas, look to Lake Buchanan. The great Colorado River feeds Lake Buchanan, the oldest and second-largest of the region’s Highland Lakes. Lake Buchanan is a scenic wonderland, where you’ll indulge in stunning landscapes, sprawling beaches, adrenaline-pumping recreation, cool waters, and so much more! Spanning into Burnet and Llano counties, Lake Buchanan’s waters spread across 22,333 acres. This impressive amount of space means that everyone has plenty of room on the water, which is just what anglers need to get the job done. Striped and white bass fishing is particularly good here, and you’ll also find several other varieties of bass, catfish, and crappie. When fishing for largemouth bass, your best bet is to search out the murkier waters near Beaver Creek in spring and autumn—the fish keep near the surface under these conditions. Another useful tip is to watch the sky. Striped and white bass are known to chase the schools of shad worked up by birds on the surface. The fish aren’t the only ones who enjoy the unique topography of Lake Buchanan. The western side of the lake draws sunbathers and swimmers with its striking granite pebble beaches, while the eastern side showcases sheer granite cliffs, cascading waterfalls, and untamed desert landscapes. These spectacular views can be savored from both land and water by either taking a leisurely drive around the lake’s rim or speeding across the lake's surface on a motor boat. Surrounded by such natural beauty, lake homes for sale boast the best landscaping around! Lake Buchanan is just as revered for its conservation efforts as it is for its recreation. Three parks surround the lake, serving as crucial wildlife sanctuaries that bring nature to lake goers. Cedar Point Recreation Area, Black Rock Park, and Canyon of the Eagles host bald eagles, golden-cheeked warbler, and black-capped vireo. Bird watching is a year-round pastime. Head to any local golf course and enjoy a game that incorporates the Lake Buchanan scenery. A few notable courses include Hidden Falls, Blue Lake, and Slick Rock. If you’re interested in living on a Lake Buchanan golf course, check out GolfHomes.com for details. Lake-view properties are encircled by the bounties and wonders of nature. Witness one of the largest migrations of American Bald Eagles from November to March, and see the landscape burst into life with an explosion of wildflowers each spring. And it wouldn’t be spring without the annual Lake Buchanan Regatta, where boats fill the water to celebrate the warm weather. Lake Buchanan is the oldest, largest and northern most of the Central Texas Highland Lakes famous for its striper bass fishing and its close proximity to Austin, TX. The 31 mile length, 5.5 mile width, 124 miles of shoreline and 23,200 acre feet of water, give Lake Buchanan plenty of room for all types of recreational activity. 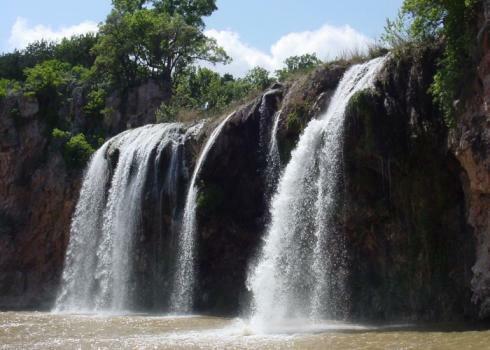 Lake Buchanan is blessed with numerous cascading waterfalls. The American Bald Eagle winters along its shoreline. An award winning vineyard and winery is a special attraction to visitors. Cruises to the Colorado River headwater of the lake yield a glimpse of the early Texas wilderness. The variations in the shoreline offer areas hilly and rugged with granite cliffs and very deep water while other areas offer smooth, sloping beaches ideal for swimming, wind surfing and picnics. Fishing on Lake Buchanan is awesome with record striper bass, black bass, white bass, hybrid bass and catfish being frequently caught. 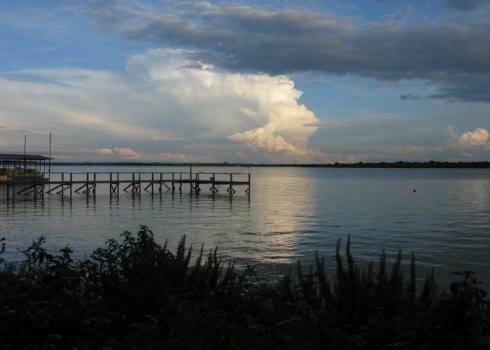 Even today, Lake Buchanan is called the best kept secret in Central Texas. 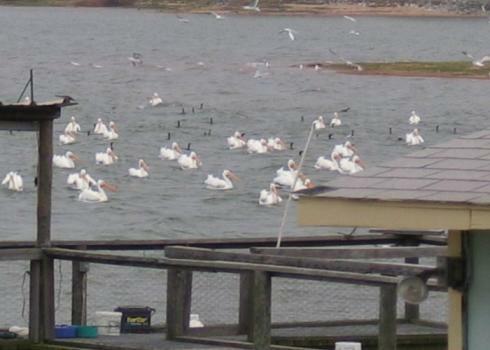 Lake Buchanan is located 60 miles northwest of Austin and 95 miles north of San Antonio. It is about 200 miles south of Dallas and Fort Worth and 200 miles west of Houston. Lake Buchanan is 30 miles long with a width at the widest point of just under 5 miles and a shoreline of 124 miles. When it was built, Buchanan Dam was considered to be the longest multiple-arch dam in the U.S. with a length of just over two miles. Also known as "Big Buc", Lake Buchanan has over 124 miles of shoreline and a surface area of 23,060 acres (36 square miles). RV Parks, motels, bed & breakfast inns, cabins for rent and campgrounds are available along the lake. There are several cafes near the lake: one specializes in catfish, another in good old Texas B-B-Q and some with Texas home style cooking. The lake is very popular with boaters, fishermen, campers and swimmers. The lake is so large that you will never feel crowded on the lake. There is always plenty of "elbow room" on each of the Highland Lakes. There is a nice granite gravel shore around the lake providing an ideal beach for swimming, wading and sun bathing. In 1995 over 1 1/2 million Striper Bass were stocked in Lake Buchanan. Lake Buchanan is very popular with Striper Bass fishermen. Bass fishing on the lake is usually very good. Striped Bass, White Bass and Black Bass are plentiful. Last year the lake was stocked with another 1 1/2 million Striped Bass. There are also Catfish and Crappie in the lake. There is a Bass Busters Club on Lake Buchanan for the local fishermen. It is a local organization that has monthly meetings and sponsors Bass Fishing contests several times a year on the local lakes. They have Bingo every Wednesday evening that is open to the public. Fishing Regulations: The daily limit for Striped Bass is 5 fish and length must be 18 inches or more; for White Bass the daily limit is 25 fish with a length of 12 inches or more. Lake Buchanan has been stocked with several species of fish intended to improve the utility of the reservoir for recreational fishing. Fish present in Lake Buchanan include largemouth bass, catfish, white bass, and striped bass. Lake Buchanan is a level-controlled reservoir, and will not be allowed to flood during periods of heavy rain. The lake level can, however, drop significantly during periods of drought. Lake Buchanan attracts fishermen from all across Texas due to its excellent Bass fishing. The species of fish in Lake Buchanan include Large Mouth Bass, White Bass, Striped Bass, Catfish, White Crappie, and Sunfish. The Texas Parks and Wildlife web site provides some excellent tips for fishing on Lake Buchanan. In addition, fishermen can hire a professional fishing guide (listed below) to ensure you have the most successful fishing excursion possible. Specializing in Stripers, trophy cats, and White Bass on Lake Buchanan/Inks Lake. Striper fishing with Jim Crawford on the Highland Lakes of Central Texas. Striped Bass guided fishing trips on scenic Lake Buchanan. Over 20 years experience as full-time guide. We provide everything you need, bait, rods & reels and filet and bag your catch. The only thing to bring is food, drinks, and of course an ice chest to carry your catch home. Live & fish on Lake Buchanan. Can guide in all conditions & help you find the best fish. Rick Szukalla has been fishing & guiding on Lake Buchanan for over 15 years. We use top-of-the-line fishing tackle, rods, & reels. Clients are taken to fishing grounds in fully equipped sportfishing boats to locate striped bass that populate the largest lake in Central Texas. Inks Lake State Park is 1201 acres of recreational facilities adjacent to Inks Lake on the Colorado River in Burnet County. The park was acquired by deeds from the Lower Colorado River Authority and private owners in 1940 and was opened to the public in 1950. Inks Lake is a constant level lake located in the Highland Lakes chain (7 lakes) surrounded by granite hills. Visitors enjoy camping, backpacking, hiking, and golf. Since Inks is a constant level lake, droughts do not affect water-related activities such as lake swimming (unsupervised beach), boating, water skiing, scuba diving, and fishing. Longhorn Cavern State Park south of Burnet in Burnet County, is 639 acres classified as a scenic park in the rugged Hill Country. Longhorn Cavern was acquired in 1932 - 1937 from private owners. It was dedicated a state park in 1932, was opened in 1938 and was dedicated as a natural landmark in 1971. The Lake Buchanan Chamber of Commerce is conveniently located at Buchanan Dam on Highway 29. You will find plenty of literature and information about the tourist attractions in the Highland Lakes area as well as information about local business members of the Chamber of Commerce. The Chamber is eager to provide brochures and literature to tourists and people considering retiring in the area. There is also a nice gift shop at the Chamber's office with souvenirs from the Highland Lakes area.The office is open from 9:00 am to 6:00 pm on Mondays and Thursday through Saturday. The Sunday hours are 1:00 to 6:00 pm. The office is closed on Tuesday and Wednesday. Other than boating and other lake activities, the area is also popular for the art galleries and the wildflower tours. In April and May the area turns into a virtual wildflower paradise with millions of flowers covering the fields. 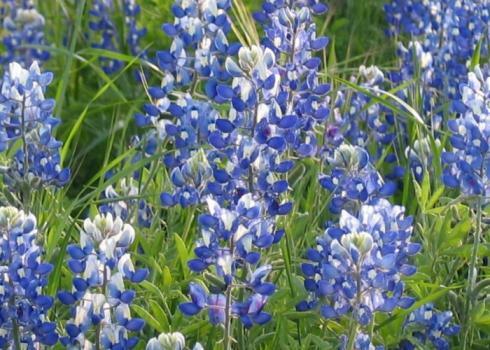 The Bluebonnet flowers are a favorite among the tourists. The Indian Paintbrush flowers are also breathtaking during April of each year.